If your bike has been in hibernation over Winter, the latest ‘Stunning Silver’ Morpher folding helmet is the perfect excuse to get back in the saddle in style. 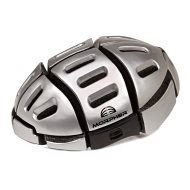 The multi award winning Morpher folding helmet is an indispensable piece of equipment for the modern day cyclist. It opens and closes in seconds, keeps you safe on and off-road and comes in a range of stunning colours, which ensure that you look the part too. The innovative helmet was invented by Jeff Woolf OBE, two times winner of British Inventor of the Year, to cater for the 82% of cyclists who don’t wear a helmet because they are too much of a nuisance to carry around. The ingenious Morpher presents the ideal solution. At just 2.8 inches at its widest when folded, it can fit easily into a laptop case, bag or briefcase, so you no longer have to turn up to that meeting with your bulky headgear clanking around in tow. While far more practical than the old style rigid helmets, Morpher is in fact just as safe. It is fully CE EN:1078* and CPSC safety certified and whether you’re a holiday maker, commuter or bike share scheme user, the helmet will help to protect you, and provide peace of mind. Morpher places importance on the wellbeing of the planet too, so most of the helmet’s components are recyclable. Showcasing maximum functionality and minimising fuss, Morpher is the answer to your cycling needs this Spring. Get out on your bike and join the thousands of cyclists experiencing the benefits of this revolutionary helmet. Press release distributed by Newsmakers on behalf of morpherhelmet, on Tuesday, 20 February 2018. For more information subscribe and follow https://twitter.com/newsmakers_pr .